Budget travel with pets requires some homework. Pet travel is one of those subjects that deserves some research--not only to save money but to provide the best possible situation for your pet. 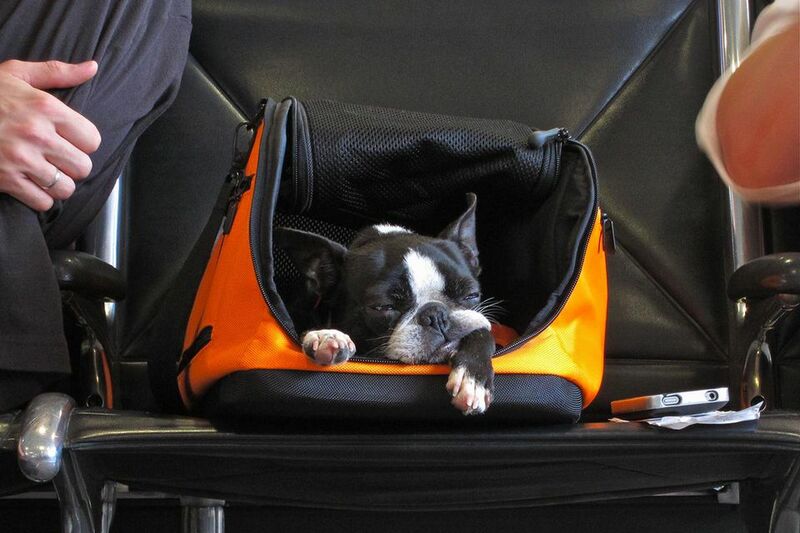 Pet travel on airlines falls into two categories: carry-on and luggage. As you might imagine, both methods for transporting your favorite pet are getting more expensive. Fees of at least $100 USD one-way are now commonplace. It's one of those airline fees that might have existed in some form for years. Expect these fees to slowly increase with time. Much like baggage fee schedules, travelers must dig deeply into the sitemaps of their favorite airline websites to find pet fee information. For example, I found the pet fees for United within the web hub for "travel information." In order for your domesticated pet to travel with you in the cabin, reservations are required on flights with cabin pet space available. If space is available, there is a $125 one-way fee. Early reservations are essential when you travel with pets, so you might miss out on last minute deals. Pet owners argue that since they have paid for leg room as a part of their fare, placing a small animal carrier under the seat should not necessarily incur another charge. But airlines need revenue to survive, and they are becoming quite good at finding new ways to raise money, charging for blankets, snacks and soft drinks on some flights. Shipping larger pets as cargo can become extremely expensive. US Airways won't do it at all, citing the high temperatures in hub cities like Las Vegas and Phoenix. For budget travelers, sometimes there is good news on the pet front. Fees on some carriers have tumbled in recent years. The New York Times, for example, reported some time ago that Delta had lowered its pet fees from $275 to $175, and the charge is now $125 one-way for pets that are carried onto a flight, down from $150). Be aware that airlines approach this issue with a variety of philosophies. Frontier once would not accept pets in their cabins -- only as cargo. A spokesman called that policy a "customer service issue" because some passengers have allergies or simply a low tolerance of other people's pets. But Frontier now allows certain domesticated pets in its cabins. The Frontier pet policy is quite specific and bears a careful reading before you head for the airport. Most major bus lines in the U.S. do not allow the transport of animals other than service dogs. Since budget travelers sometimes take the bus, this isn't good news. Plan accordingly. Many otherwise reasonably priced hotels will add a pet charge. The reason that "pet-friendly" rooms need constant attention, and this costs money. Most places will also hold you liable for any damage your pet does to carpeting or other furnishings. If your dog barks at night and causes another guest to check out on the first day of a planned three-day stay, expect to hear about it and pay compensation for the loss. Other places, of course, will not allow pets at any price. To get a better handle on these lines of acceptance, check out PetsWelcome.com. Here, they claim to have a database of 25 thousand hotels, B&Bs, ski resorts, campgrounds, and beaches that are pet-friendly. Don't automatically assume that your intended hotel prohibits pets if it isn't on their list. Use this resource as a starting point for pricing hotels that will accept your pet, along with noting any additional charges. Another handy feature here is an international database that includes pet policies in dozens of countries. Amtrak has a no-pets policy. The only exceptions allowed on Amtrak trains are for small pets and for service animals accompanying passengers with disabilities. It's a different picture aboard most trains in Europe. The heavily traveled lines in France, Germany, and Italy usually allow pets, as do trains operated by national rail in England. For a nice directory of train policies and prices, check PetTravel.com. BringFido.com offers a list of "pet-friendly destinations" and dog travel considerations, including 10 tips for flying with Fido. GoPetFriendly.com offers a database of service providers across the U.S. Pet sitters, kennels and veterinarians are all within a few clicks for many popular destinations. PetTravel.com supplies a helpful list of what airlines expect in terms of size and construction of pet carriers. Here you can shop for a carrier that fits your budget and your airline's requirements. With that in mind, PetTravel offers links to airline rules for carrying pets.